Trade in cultural property is a major, and growing, international There is a vigorous licit and legal trade that reflects a positive recognition and appreciation of culture and art forms. Unfortunately, beyond the licit trade an international illicit traffic keeps increasing worldwide. 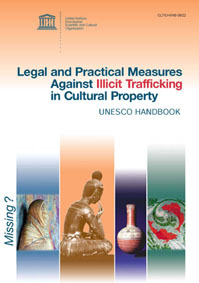 This handbook briefly draws attention to some basic legal and practical measures and tools to help combat illicit trafficking in cultural property.